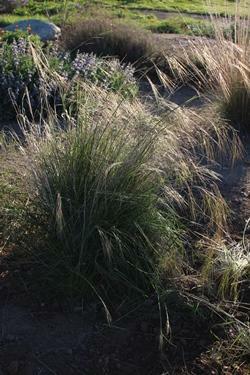 A perennial bunchgrass with flowering stems up to 3'. Flowers in Spring. Will reseed - but not a pest. Gives added texture to the garden as the seed stems blow with the wind. Will give native garden a natural, random look as new plants are extablished - thin what is not desired. Popular with the Forest Service and CalTrans for reseeding and stabalizing bare areas and slopes. Very easy to grow. Great as an accent between shrubs.